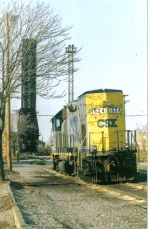 Description: CSX 1524 sits in the CSX rail yard. Description: With its conductor looking back on the train, CSX 1524 continues on southword, running alongside 32nd street, after crossing Nern St in Port Huron's south side. As an added not, this is the former PH&D line. October 2005. Description: D750 slowing to switch the team track at Sterling.